Good afternoon…another toasty day in the KC area with temperatures well into the 80s. This obviously has been a crazy warm month so far and there is no real end to the unusual warmth over the next 5-10 days or so. There may be a day here or there with some slight relief IF we get more clouds or additional rains in the region but there is nothing really glaring in terms of higher coverage or cooler temperatures showing up right now. Friday>Memorial Day: Hot and humid with temperatures near or above 90°. The thunderstorm risks each day are pretty low but since the pattern says summer there could be some random stuff around in the later PM or early evening hours. The exception is that Friday may bring some increased activity in the area but the data isn’t that overwhelming today. IF we get some additional rains on Friday that would hinder the highs and perhaps keep up a bit less hot. 1st radar for today. the Pleasant Hill radar has been down since WED afternoon…their doing some work on it…installing new hardware and software I believe…so let’s show you Topeka radar…because there are bubbles of storms out there. HRRR short term model has this…via IA State. My goodness this month…here you go. The tweets above are pretty startling to see how May has gone at least. There are no real signs that it’s going to change anytime soon…as a matter of fact it’s going to get hotter it seems before any relief occurs (for more than a day or two). The problem with that is soon we’ll be flipping the calendar to the month of June when it gets hotter anyway. It’s worth noting some record highs as we finish the month of May…just for the heck of it. Need to watch those on the 26th>28th…we may get awfully close. Meanwhile…let’s get into the randomness of the blog…and I’m going to start out with some not so good news that’s been circulating for the last few days. Remember this launch back on March 1st? Well as the saying goes…NASA we have a problem. “Detectors for the infrared channels must be cooled to around 60 Kelvin (minus 351 degrees Fahrenheit) to make them fully sensitive to infrared light coming from Earth’s atmosphere. For about 12 hours each day, the cooler inside the Advanced Baseline Imager, or ABI, is unable to chill the detectors to such cold temperatures, officials said. This is a problem with more ramifications including the fact that a lot of the infrared data is also fed into computer models…which won’t help the cause down the road at all. Now I know what you might be thinking…well let’s launch a space shuttle up somewhere in the future…do a spacewalk…and replace the part. You can’t. Why? Because the satellite orbits the earth more than 22,300 miles up. The space shuttle only goes on average about 250+ miles up. That’s about a 22,000(!) mile difference! So that though (a good one) won’t work. So basically IF NASA can’t figure this stuff out with various work-arounds and software attempts at a fix/solution…this satellite will not be performing at near it’s capability. It cost about $225 million to launch that satellite + about $350 million to build it (along with 3 others-one of which is just fine and we use it every day). That’s about a $600 million floating around up there…not doing everything it’s capable of doing. Meteorologists shed a small tear (maybe a bigger one for some) when news of this came out the other day. The area that will be most affected is towards the western US into HI and AK. This satellite was a big deal for them…still is…but now apparently degraded. 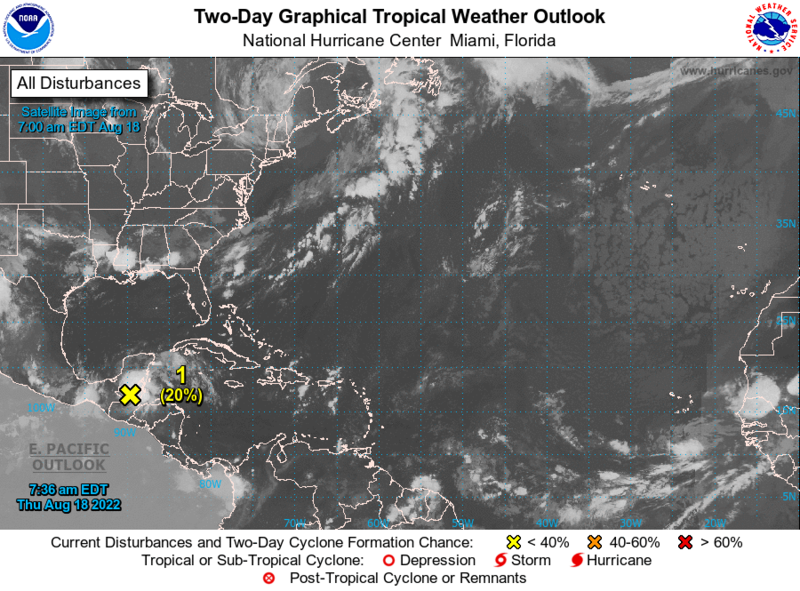 There is a system now trying to organize into “soomething”…perhaps Alberto over the weekend. It’s off the coast of Cancun Mexico. Regardless of what strength it has or doesn’t have…the rain is the main thing with this…and parts fo the Gulf Coast are going to see a lot of it. The EURO through WED of next week is cranking out in excess of 15″ of rain for some areas down there. 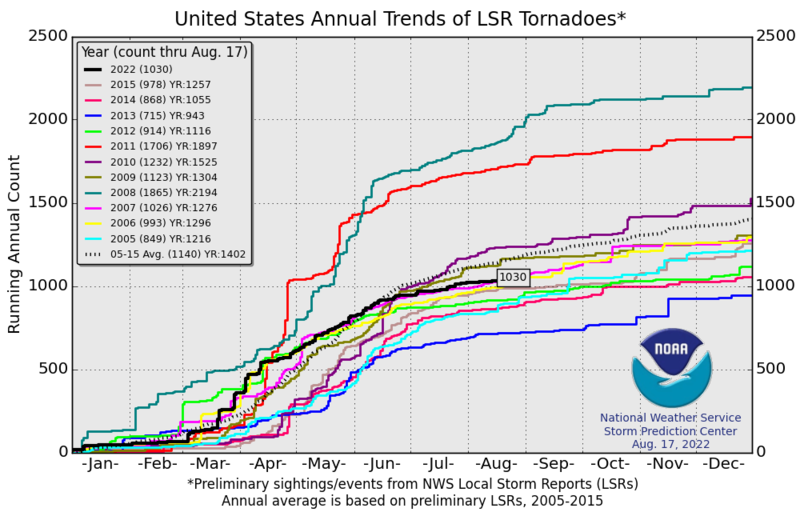 Speaking of 2013…that’s the last time there were so few tornado reports through 5/23. Our feature photo is from Wade Welch…showing a nice cumulonimbus cloud out there yesterday…there are more out there this afternoon. Here’s hoping you get some rain. Finally this tweet has aged well…this was from Sunday night when I thought that the rains would be so isolated through yesterday that it wasn’t worth getting people’s hopes up. I was highlighting tomorrow (FRI) with the best chance of rain…hopefully that part of the forecast works out!